This workshop is about Transient Alert Mechanisms at all wavelengths in context of the Cherenkov Telescope Array (CTA). The goal of this workshop is to connect people from different instruments and collaborations to develop standards for the generation, dissemination, distribution, and reaction to multi-messenger events. Particular focus will be to investigate potential scientific synergies for implementing methods for automated follow-up observations. This workshop will give outside parties (from small optical telescopes to space programmes) the chance to connect to these developments. The detection of astrophysical transients has become very important in astronomy and many efforts have started to enable follow-up observations at other wavelengths within hours or even minutes of a transient detection. 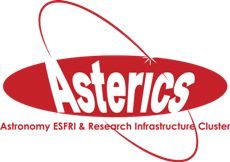 A common interest of the ASTERICS partners is to port these practices to multi-messenger astronomy and implement them for the large-scale RIs (including the E-ELT) of the future. The exchange of the event messages can be implemented through VOEvents, defined by the Virtual Observatory community. However, for joint programmes this effort must be enhanced to include the exchange of instrument status information and to define and implement handshake protocols to allow predictable and reliable handling of follow-up, or joint, observations. Because future observatories may create up to millions of alerts per night (e.g. LSST), a critical focus area will be on tools that can distil the most promising triggers for a specific facility. This implies a major effort dealing with the receiving system, authorisation, prioritisation and identity methodology. While the talks of this workshop are by invite only, we encourage you to register if you plan to attend the workshop.